I haven’t done a 7 Quick Takes in a while, but I feel like life is just flying right now and I’m bursting at the seams. I feel like I’m in a time of my life right now that I will always look back on. Everything is uncertain, but unlike all the other times of uncertainty in our lives – it’s different right now. It’s all starting and we’re just along for the ride. 1) Writing. Writing. Writing. It’s been weeks, a month maybe, since this possibility first became a possibility. KP and I have gone back and forth, crafting what is currently a 9 page document. It’s amazing how it’s changed from the first draft. Getting notes, making changes, passionate discussions amongst KP and I as to best directions, soul searching, marriage relationship building, juggling topics of life and death and faith and love and culture. This is all new to me and I am overwhelmed – and I love it all. Maybe I’m just a dreamer. Maybe I’m naive, getting my feet wet in this world for the first time while tagging along with my husband. Maybe I have too much hope. But I also know the weight of what we’re getting into and what this could be. It’s big – but I feel we’re equipped to handle it. And this is only the pitch/treatment. There is so much to possibly/hopefully come. 2) My patent application is due in 20 days. I am not prepared. NOT. AT. ALL. Not even remotely. Not in the slightest. Several weeks ago (oh crap, it’s actually been a whole month ago now) I did an exhaustive patent search and discovered that back in 1986 a French patent was applied for (and subsequently filed with the European Patent Office), but abandoned and never granted, that incorporated part of the invention that I have come up with. Though an obscure find, this threw a snag into things. After consulting with a patent attorney, it was confirmed that, as I suspected, this part of my invention is considered free use. I can still obtain a patent for my invention, but I would have to distinguish any of my claims separate from that one part. This all happened right around the time that #1 above happened and well, the whole idea of applying for a patent was thrown way back onto the farthest backburner of my mind. 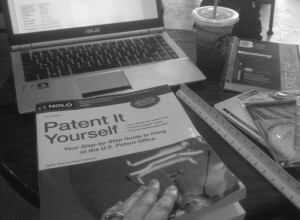 3) I’m a coffee shop right now (feeling all cool at the “hip” Starbucks 🙂 ) with my patent book and drafting tools and ready to dive into this thing. I’m kind of freaking out. 20 days y’all. 20 days. I don’t know if I can do this. Or if I should. It’s a lot of money to file a patent. And I’m feeling somewhat discouraged after stumbling upon the snag referenced above in #2. The only reason I’m still considering it is because I don’t want to feel like all the work I’ve done on it so far is a waste. I want to feel accomplished. But ugh, guys, it’s a lot of work. I don’t know if I can do it all in only 20 days. Filing for a patent is no joke. And #1 is still huge on my mind and taking precedent over everything right now. KP and I are hoping to hear back from our latest (and maybe last?) revision right now before moving on to next steps. I don’t have time or mindspace to work on a patent right now. Remember those things called kids? Oh yeah, that’s right, I have two little ones; they take a freakishly lot of time out of my day as well. 4) Extended Missing Parts Pilot Program. I had read about this somewhere once before, but I just stumbled upon it again and paid closer attention this time. Um, I think I almost cried. Huge weight off my shoulders!! Yes, I absolutely realize that none of you reading this know what I’m talking about, but that’s totally ok. It’s good news. What is means is that I can file some stuff toward my patent now, pay the smaller filing fee, but then have another 12 months to fill in the missing pieces of my patent application and pay the rest of the fees. This feels like a gift from heaven! I don’t have to choose – right this very instant – if I’m going forth with this patent and exhaustively throw myself into it for the next 20 days! I still have work to do, but it will be much (MUCH!) more manageable and the fees will be much more affordable for right now. Maybe I can still do this patent thing after all. 5) Jobs. Changes. Daily Schedules. I have no clue what we’re doing right now. Now that KP is no longer going into an office everyday, we’ve both been home. He’s doing freelance work, and I’m doing, um, sort of writing a patent application? And writing a pitch with my husband for a movie that might hopefully turn into a paying gig? (It’s an amazing story that I’ve been personally impacted by, so fingers are crossed and prayers are being said that this happens!) I’ve applied to a couple online schools for next year…I guess we’ll see where everything goes? But it’s weird that it’s a Thursday afternoon (as I’m writing this). With both of us home, every day blurs together and feels like a pseudo weekend. 6) We can’t get used to this though. KP is going back to his old office job again in a few weeks. And then I’m flying to Texas with the kids. And then by myself – for a whole weekend alone! – to Charleston (which btw, is a city that my thoughts, like many of ours, are going out to right now). Do other people have weird lives like this? It’s probably only in L.A. where this constant transient life is somewhat normal. 7.5) Oh, and I’m hosting a giveaway for a Datelivery At-Home Date Night Box. I don’t have a lot of entries yet, so you have pretty decent chances of winning if you want to enter. Good luck to you! Thanks for stopping by and listening to today’s rambling thoughts!